Russia’s legendary firearms producer Kalashnikov will for the first time introduce the modernized AK-74M at the Victory Day parade on May 9 on Moscow’s Red Square. Kalashnikov claims that the famous assault rifle will now be 50 percent more accurate. 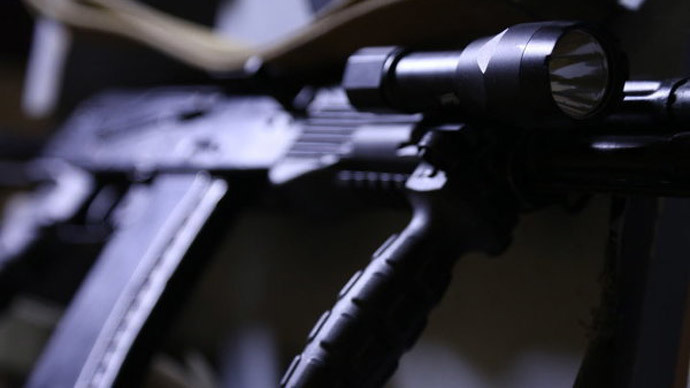 The new assault rifles will be equipped with modern optoelectronic and laser aiming devices, gun flashlights for low visibility and low noise shooting equipment, the Kalashnikov Concern said Tuesday. The rifle will also include a 40-mm grenade launcher and a bayonet. The upgraded AK-74M will be 50 percent more accurate at a distance of up to 300 meters at any time of day and in various weather conditions, the company added. The modernized weaponry will be demonstrated by the cadets from one of the two top Russian naval schools, the Pacific S.O. Makarov Higher Naval School and the Black Sea Admiral Nakhimov Naval Academy, at the Victory Day Parade on May 9. The military show on Moscow’s Red Square will mark the 70th anniversary of the Soviet Union's victory over Nazi Germany. Kalashnikov’s innovations will be joined by Russia’s newest hardware, which will include the Armata medium tank - a cutting-edge vehicle with an unmanned turret armed with a brand new 125 mm smoothbore cannon, the most powerful gun of its kind to date in terms of muzzle energy. The latest hardware will participate in the celebrations together with a total of 194 armored vehicles, ranging from the cutting-edge to historic pieces. A total of 143 aircraft will also represent the Russian Air Force in Moscow’s skies.